I'm not one to wake up early and make my family a hot breakfast on weekdays. It's usually grab and go for us. To kind of make up for that, we like to have breakfast for dinner a few times a month. My kids usually request pancakes, and I'll admit, I've been known to make them from a box mix. I have never made them from scratch before, but thought I'd try it last week when I made these Spiced Apple Walnut Pancakes from Golden Blossom Honey. They were so fluffy and yummy, and I loved the apple bits in every bite! And, of course, my girls always get a heaping of whipped cream on top of theirs. It's probably why they always request pancakes! Do you do breakfast for dinner ever? What is your favorite fruit to add into pancakes? Dezzz you said you were on a diet! Listen to her, Dezz. I know you won't listen to me. Hi Theresa. Hmmmm my favorite fruit to add into pancakes... Let's see.... No, not blueberries... Apple. Yep, that's it. Not particularly adventurous, I know. I'm with Dezzy! If you ever need to live somewhere.... just saying! Dezz is nutts! Mixed nuts! Just saying. Ok, but I think we can agree Blue will NOT be staying with us. Anyone who thinks their snoring is beautiful is clearly insane. I'm more of the waffle, pancake, french toast kind of girl too. I do like a casserole on holidays like Christmas, otherwise, I stick to breakfast basics. So, those would be a huge hit in my house. I think I would need to make a double batch. I want those! I am definitely going to be making those this weekend. Just the pictures have me drooling. Yum! These are perfect for our next brinner. (breakfast/dinner). I'm a huge pancake fan. I'm all about waffles, too. It looks amazing, but hold the walnuts for me. 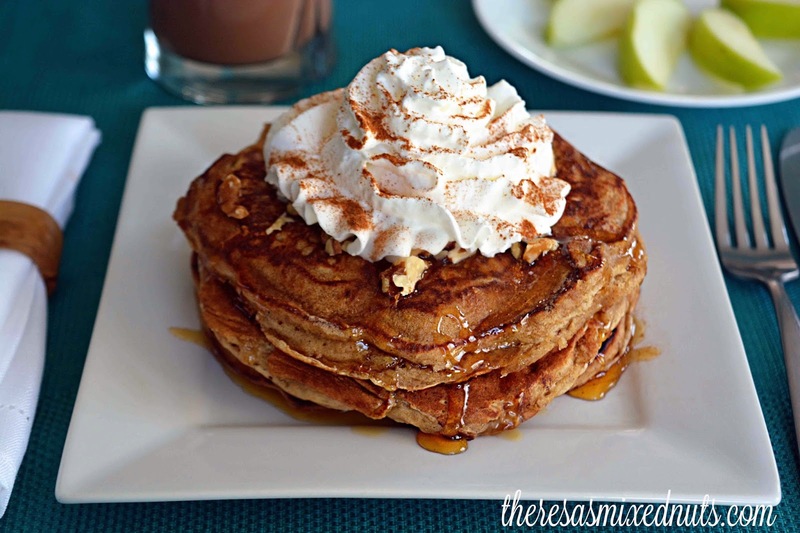 I love some spiced apple pancakes! Wow, these just sound awesome. I usually eat pancakes with very little syrup so these would be perfect! Yum! I'm not a huge pancake or waffle gal, but these? Sound amazing! They look it too yummy! I love honey and walnuts in pancakes. I've even been known to top cornmeal pancakes with honey and a bit of bacon! I love using honey in recipes. It makes things moist and just a little bit sweet. You always post the yummiest recipes. This one looks especially good - nice and warm and fluffy and...what time is breakfast? YUM! This looks like one of those meals that you sort of stare at and wonder if you really can eat the whole thing, but then you do, and can't wait to have it again soon! I made funnel cakes yesterday and I wish I would have gone this route....these look so much better! Maybe I will have pancakes today! Have a great weekend Theresa! Funny, I thought I woke up already but after seeing these pancakes I have to be dreaming. Suddenly it seems we will be having breakfast for dinner at some point next week. I'd request whipped cream on mine too, mmhmmhmm!! Those look delicious! These sound super super tasty! I love pancakes! These pancakes look super good! I'm going to make them for my kids! My husband would flip over these! And honey is a staple in our home. Love, love, love honey! True story. I just had some pancakes for dinner. My husband just brought me some freshly tapped maple syrup from his cousins tree. I love apple season. My husbands aunt has an orchard. At the end of the season we get a ton of bushels of apples. We make quite a few pies and cobblers. Make apple sauce and we can. That looks AMAZING! I would totally be indulging in that kind of pancake and the topping looks so good. Oh my! These look SO good, I'm about to go to bed but looking at these make me hungry! We have breakfast for dinner a lot. Our favorite thing to add to our pancakes are strawberries. If I'm eating alone and too lazy, I do love to have cereals for breakfast! :P With milk and honey too! Those pancakes sure look yummy! We love breakfast for dinner. We usually have the typical eggs, bacon and toast. My kids don't venture out of their food comfort zone too much. Oh wow, these look SO delicious! Now I want some breakfast for dinner. I want some of those yummy pancakes . We usually have honey for the tea and toast. But this one looks great..
Those look super yummy. I like to eat breakfast foods any time of the day. I know my whole family would like these If I made them. They would even use the honey as syrup on top.